Can the Devils Shoe String be broken into pieces to line the walkway leading up to my front door or is it best to leave them as is? I know Devil Shoe String isn't an expensive product and I did in fact include more in my recent order. I apologize if this is a silly question. You can break it into smaller pieces of you like. That might make it less noticeable. I have a question though. Are you putting it along teh walk way so people will step over it or along the sides of the walk way where people would walk beside it? I would recommend having it in a place where people have to step over it. I have it along the sides of the walk way where people will walk beside it. No one will step over it unless they are cutting through my yard. The path to my front door is enclosed by brick as in I don't have a porch. Thinking maybe I should put it under my doormat instead. Thank you for your response. It's greatly appreciated. I would place it under the doormat if your entranceway is all brick. Natstein is correct in that you want it set in a manner that it needs to be walked over. Thank you Miss Athena for your response. can all the Viburnums be used as Devils Shoestring? For instance, Viburnum opulus, or does it have to be a specific plant? It would depend, i think on what the local name for the plant was. "Devil's Shoe Strings" is a common name, not a Latin name. Plants other than Viburnums are also given the common name of Devil's Shoe Strings. A plant given that name as a common name is what you should be looking for if following the traditions of folk magic is your interest. Thanks for the information, cat. I'm interested in Hoodoo, as well as herbalism, so I'm any topic concerning Southern herbs fascinates me. From reading Hyatt's books, it seems that Devils Shoe Strings is featured prominently in Hoodoo, so I was curious about it. I have already purchased and will be using one uncrossing kit for both myself and my girlfriend. We do not live together. Can I split the bag of shoestrings between the two of us or is it best to purchase a seperate bag of shoestrings for her? It would just depend on how much has been sent to you. If it's a lot, then, yes. If not, then buy another package. But how much are you "Splitting" of everything? You cannot split the mojo hand and you cannot split the uncrossing bath. This will be a very weak spell if you split everything for 2 people. Thank you for replying. 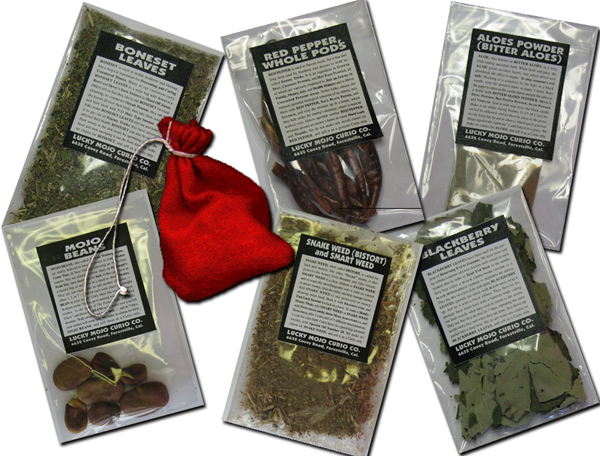 I have bought an extra strength mojo bag for her and I have bought the 13 herb bath for 13 sessions. I figured I would keep some on hand to cleanse every so often. I also bought another uncrossing bath crystal pack for her. Thank you for the confirmation Miss Aida.